Ph.D. in community engagement students present program reviews to the POISE Foundation Oct. 13 in West Penn Hall. 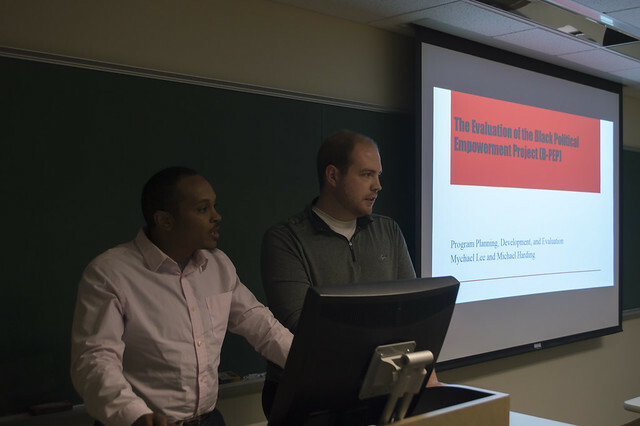 As part of their coursework in the Program Design, Implementation and Evaluation class, Point Park University Ph.D. in community engagement students developed program reviews for the POISE Foundation, a 501c3 organization in Downtown Pittsburgh that provides fiscal sponsorship services for projects, organizations and individuals in need. "This assignment gave me the opportunity to engage with an emerging nonprofit in the City of Pittsburgh," said student Veronika Panagiotou. "My cohort member and I were able to apply the evaluation skills we learned in the classroom and use them to support an organization that impacts children in the community." "This assignment allowed us to have real-world context and application to some of the programmatic and planning challenges that an organization may face as it develops," said student Leatra Tate. The students presented their findings Oct. 13 to Aerion Abney, program officer for POISE, and Dr. Howard B. Slaughter, Jr., a professor at Point Park. "My goal was to give the class a real-world experience, which is why I sought out POISE to provide such a perspective on program development, evaluation and assessment," said Dr. Slaughter. Student Kendra Ross remarked that Abney found great value in the information presented. "Likewise, he offered each set of students useful feedback that should serve them well in their future endeavors." When asked what she has enjoyed most about Point Park's Ph.D. in community engagement program, student Trish Gadson values the cohort model and social lab. "We are diverse in age, work experience, life experience, race/ethnicity and world views," Gadson said. "Resultantly, it leads to challenging and diverse conversations about complex social issues. We are living the intention of this program."